You can upgrade the firmware for BlackVue car dashcam easily using the BlackVue app in your smartphone. ​3) Select the firmware for your BlackVue dashcam, for example DR650GW-2CH (English) and OK.
​5) Download in progress and wait till the download completed. ​6) Make sure that the WiFi on the BlackVue is switched ON. For iOS, go to the Settings > Wi-Fi of your smartphone. For Android OS, please skip to step 8). 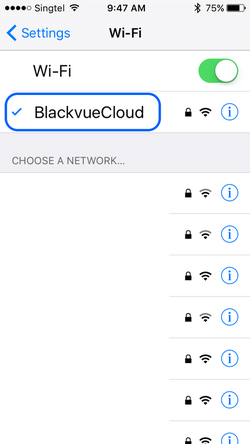 ​8) Go to BlackVue WiFi of your BlackVue app. ​9) Select your BlackVue camera for Wifi connection, for example BlackVueCloud (default name is DR650GW-????? or BlackVue650S-??????). ​12) Select OK if information is correct. ​13) Select OK for confirmation again. 15) Upon completion, camera will reboot and after about 25 seconds later it will starts normal recording. a) WiFi SSID, WiFi password, time zone and settings will be reset to default for DR650 series after upgrade. Please set accordingly if in needs. b) WiFi SSID and password will be retained for DR590, DR750 and DR900 series after upgrade.